This is the perfect course if you’d like to sharpen up your knife skills and gain confidence when choosing or using a knife in the kitchen, making preparation easier, more efficient and most importantly, safer. You’ll fillet a whole seabass, cooking each fillet differently; one will be steamed and the other pan fried. 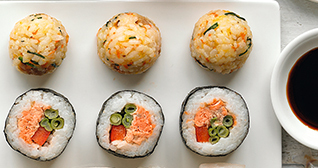 We will teach you the secrets of producing satisfyingly simple and delicious sushi at home. We will cover several different rolling techniques, dipping sauces and of course how to perfect sushi rice. By the end of the lesson you will have mastered the art of new age sushi, including California hand rolls filled with panko fried king prawn, maki roll of wasabi crab, pancetta and avocado and the classic nigiri; a hand shaped rice topped with sushi grade salmon. All of this will be brought together with a fresh and citrusy yuzu and soy dipping sauce. As a bonus we will supply you with your very own sushi mat to take you on your sushi journey. Due to popular demand, we present our advanced fish course. 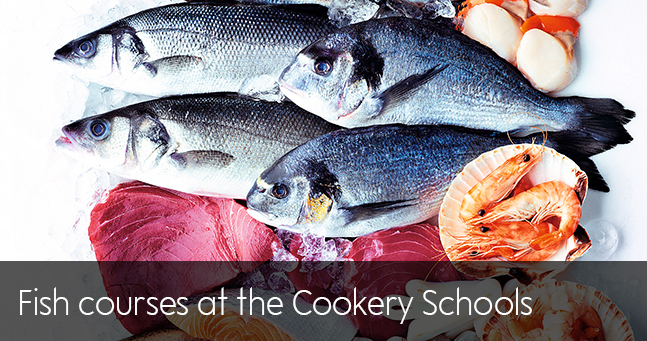 This is a hands on course where you prepare, cook and eat four fantastic fish dishes. You'll be filleting and pin boning your way through mackerel, brill, plaice and sea bream; then each fish will have it's own specific cooking method and garnish to bring out the best of the day's catch. For fish and seafood lovers, this course is a must as we take the fear out of fish preparation and cookery. You will cook impressive dishes that we are certain you will repeat time and time again. Looking at a selection of fish and shellfish we'll help you to identify species and recognise the freshest fish, giving you confidence at the fish counter to select for yourself. During the hands-on morning, you will see how to fillet a flat and a round fish, prepare shellfish and cook with different methods, all paired with a variety of sauces and sides to complete your dish. Starting with an Asian-inspired crispy sea bass, you'll move on to scallops with chorizo and butter beans and to finish the day, a french classic steamed sole, brown butter, capers with brown shrimps. Enjoy all your dishes with your fellow chefs over a glass of wine. Join us and learn how to cook this rich, smokey and flavoursome stew. This one pot wonder is simply delightful; it's like a big hug in a bowl! Whether you're already a ceviche convert or not, come along and learn how to make this stunning Peruvian fish dish which can be served as an appetiser or main. The delicate balance of super fresh raw fish cubes, crunchy greens and lime marinade is perfectly complemented by a pitcher of classic Margarita for you to enjoy. If you are addicted to the intense, exciting flavours and contrasting textures of Thai cuisine then come and join us as we take your senses on a rollercoaster ride. 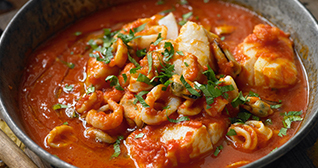 Once you have mastered the balance of hot, sour, salty and sweet tastes there'll be no going back; you'll be regularly recreating this luxurious, authentic seafood curry with ease at home. Come and learn how to make one of our favourite dishes at the school. It's a wonderful blend of exotic spices and preserved lemon, gently cooked with vegetables and a rich and zingy chermoula. It's served with freshly grilled fish of the day, mussels and a lemon, apricot, mint and coriander couscous. You will learn how to cook this wonderful dish with the careful guidance of our professional chefs and they will take you step by step through the recipe so you end up with your very own dish to enjoy. What better way to spend your evening than sipping champagne, slurping oysters and creating bloody mary spheres that explode in your mouth. A truly lavish evening! 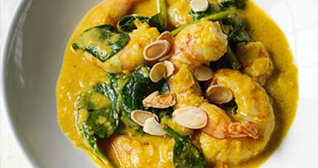 Whether you're looking for inspiration to liven up midweek meals or to impress when entertaining, this Laotian prawn and mango curry will be an instant favourite. This curry is full of flavours, textures and aromas, and easily recreated at home. 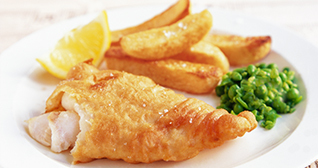 Crispy and comforting – when done well, a plate of traditional British fish and chips is simply irresistible. What better way to spend your Friday night than making your own delicious beer battered fish and chips, served alongside some homemade mushy peas. Risottos have a reputation of being difficult to make, so let our chefs show you how simple it can be. Perfect for an elegant main course, or a comforting supper. You will cook impressive dishes that we are certain you will repeat time and time again. Looking at a selection of fish and shellfish we'll help you to identify species and recognise the freshest fish, giving you confidence at the fish counter to select for yourself. During the hands-on morning, you will see how to fillet a flat and a round fish, prepare shellfish and cook with different methods, all paired with a variety of sauces and sides to complete your dish. Starting with an Asian-inspired crispy sea bass, you'll move on to scallops with chorizo and butter beans and to finish the day with a french classic steamed sole, brown butter, capers with brown shrimps. Enjoy all your dishes with your fellow chefs over a glass of wine. We will cover several different rolling techniques, dipping sauces and of course how to perfect sushi rice. By the end of the lesson you will have mastered the art of new age sushi, including California hand rolls filled with panko fried king prawn, maki roll of wasabi crab, pancetta and avocado and the classic nigiri; a hand shaped rice topped with sushi grade salmon. All of this will be brought together with a fresh and citrusy yuzu and soy dipping sauce. As a bonus we will supply you will your very own sushi mat to take you on your sushi journey.